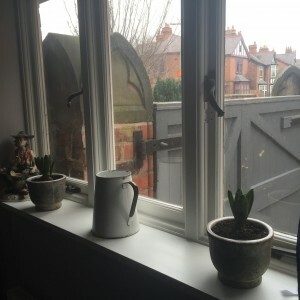 I recently discovered one of the mums from school found motivation from reading this blog as well as the book I’ve mentioned by Marie Kondo, and had a massive clear out over the half term. 6 years worth of stuff was collected from her home by the British Heart Foundation and a truly lovely thing came out of it, her late husbands piano came down out of the attic in working order, ready for the family to enjoy once again. Now you may remember in my last post 2 weeks ago, I Mentioned my gorgeous kitchen was strewn with all the boxes and stuff from the room behind it (where all the remaining clutter is being stored) well the next day I had to put it back tidily as I had guests arriving, and my gorgeous kitchen is where I serve the breakfast. 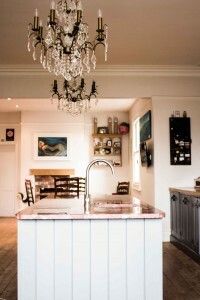 Remember I run a B&B in Shrewsbury called Ferndell…Well here is what my kitchen looks like according to my website. 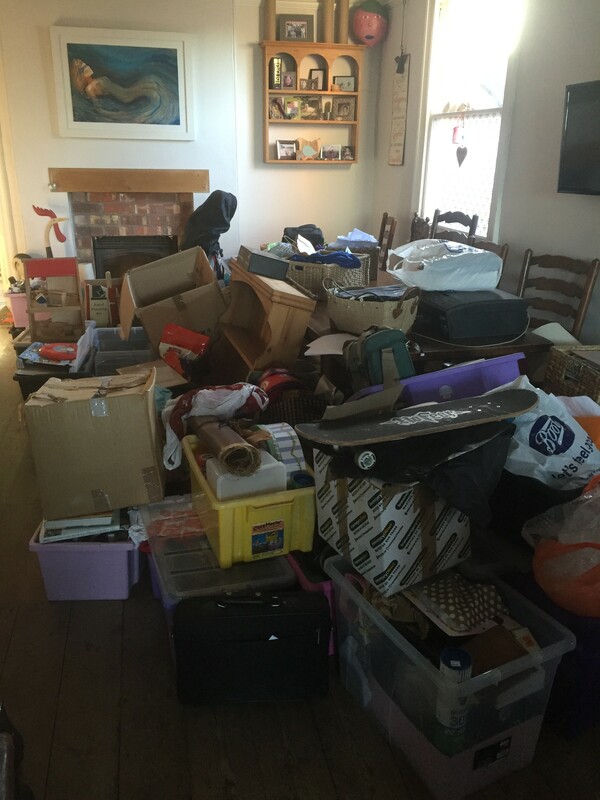 But in reality it looked like this… I know its shocking, but it’s ok, because its all hidden again stacked neatly in the room behind the kitchen minus loads of stuff I took to the charity shop. Which wasn’t my intention that day, but I bumped into an old friend in our little Sainsburys, we used to work at Wem council together and we hadn’t seen each other in years but via Facebook turns out shes has been reading this blog of mine, she has a room upstairs where the door stays shut, I have offered to go over and help, I hope she lets me, I need some guinea pigs to practice on before I set up my side line of helping others declutter. So when I got home I felt all fired up to quickly get rid of some stuff, have to admit was a nice feeling to think its not just my currently poorly friend who reads this or my twitting egg buddy, I now have 4 regular readers, (that Im aware of) but to be fair I would write this if no one read it, as its my way of keeping on target to get the clutter cleared by my birthday – 23rd July..there will be a party of sorts where the even more embarrassing “before” photos will be blown up and on display. 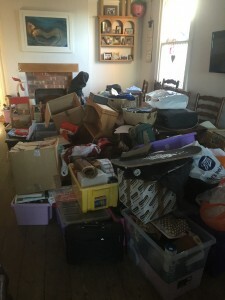 So if you are reading this blog and want to join me in a birthday drink in my decluttered room or simply need to see the photos..please come along..details will follow in future posts I’m sure. I was brave enough to post the above cluttered picture on twitter with a link to this blog and straight away I got inquires from an up-cycling twitter friend about the skate board and the wooden shelf unit, both of which are not for sale, the wooden unit will go into the room lurking behind that door above the radiator, the table tennis bats and balls will sit on it and my ugly ornament may sit on the top. 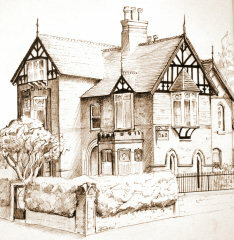 I did a post back in August about the ugly ornament click here if you fancy a read. But for now he’s sitting on the utility window sill with 2 lovely grey pots I found in amongst all that clutter. 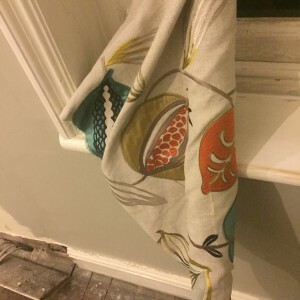 Oh before I go, just look quickly at this fab fabric I bought from Simon Boyds last week. I’m going to have a Roman Blind made for the little sash window.